Economists and the media often portray the recent unconventional monetary policies of several central banks as unprecedented. There is some truth in this, but there have been episodes in the past where the policies adopted were every bit as radical, given the standards of their time. One such case is the Bank of England’s suspension of convertibility between 1797 and 1821. The Bank of England – which was not yet a central bank in the modern sense, though it was already beginning to play a public role – had suffered a significant drain in its reserves from the mid-1790s. In 1797 it suspended convertibility of its notes into gold. It also issued small denomination notes for the first time. Banknotes became increasingly important as a means of payment (Figure 1). “In spite of the suspension … war finance did not produce any great effects upon prices and foreign exchange-rates until about 1800. To the modern student who is inured to stronger stuff, the most striking feature of the subsequent inflation is its mildness … at no time was the government driven to do anything more unorthodox than abnormally heavy borrowing from the Bank, and even this borrowing never surpassed the limits beyond which the term ‘borrowing’ becomes a euphemism for printing government fiat”. 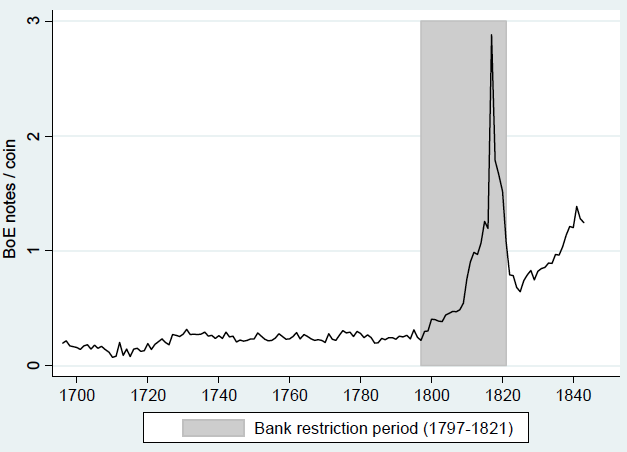 Monetary policy during the restriction period 1797-1821 was highly unconventional for the standards of the time. It would, though, be incorrect to say that it was similar to modern 'unconventional' policy, such as quantitative easing. Modern unconventional policies apply in an environment in which the short-term interest rate is zero, and hence traditional (or conventional) open-market operations are ineffective. In these conditions, central banks engage in alternative policies including the purchase of government debt of longer maturities or of commercial debt of good quality. They may also promise to keep rates at zero for a period of time to manage expectations ('forward guidance'). By contrast, during the Restriction Period the short-term interest rate was always well above zero, and the Bank of England lent to the government only on a short-term basis. This makes the label 'quantitative easing' incorrect for the Restriction Period. The main similarity between both episodes has been the rapid expansion of the Bank’s balance sheet. The current historical consensus about the Bank of England’s suspension of convertibility is that it mainly resulted from France’s remonetisation, and from the British state’s increased borrowing needs to finance a war against France. We argue (O’Brien and Palma 2016) that while these factors help us understand the timing of the Restriction Period, they cannot explain its success. We suggest that the policy succeeded thanks to the reputation of the Bank of England, achieved through a century of monetary stability. There are three broad lessons for today. First, the reputation of an institution during 'normal' times is critical in determining its success in implementing unconventional policies when they are required. Second, the interaction with the state matters. In 1797 the high fiscal capacity of the English state made credible its promise to repay the Bank. New taxes such as the direct income tax were introduced as a result of the extraordinary threat of the French revolution to the wealth and lives of the British elite. Third, temporary responses to financial crises can be hard to fully rewind, as is the case today . This is not necessarily a bad thing. For the British economy, the Restriction Period inaugurated a new era of paper money, which supported the growth of the economy during the nineteenth century.